What were you doing in the early Nineties? For me, those years marked the start of my publishing career. 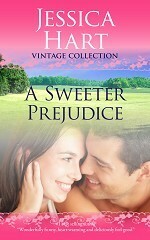 My very first book, A Sweeter Prejudice, was published in January 1991, followed by The Trouble with Love and Woman at Willagong Creek, which is still one of my personal favourites. 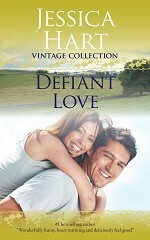 Defiant Love was first published in 1993, and Legally Binding in 1995. 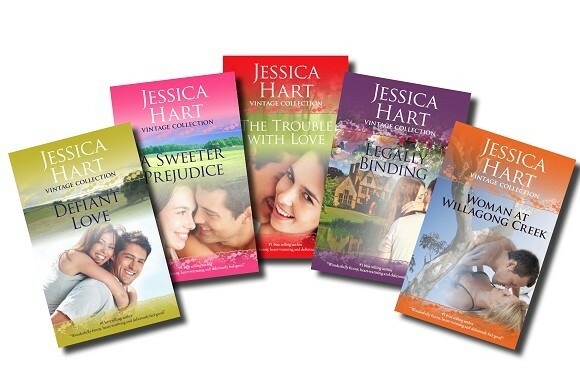 All five books are now available for the first time as e-books, published as the Jessica Hart Vintage Collection. My writing has changed a lot since those early days, but I still have affection for those first books where I was learning my craft and when the rights to five of them were returned to me, I thought it might be interesting to publish them again. I haven’t edited or rewritten any of them, so they are very much period pieces. In fact, rereading them, I was struck again by how much life has changed since then. There are no PCs in the Jessica Hart Vintage Collection. No internet, no emails, no social media. No mobile phones. People write each other letters or ring each other up on phones which have no way to leave a message if there’s no reply. It’s hard now to remember how we made arrangements at all! So why not take a trip back to the beginning of Jessica Hart and rediscover the Nineties while you’re at it? Sweet, old fashioned Abby is horrified when movie star Nick comes roaring into the calm Cotswolds village of Stynch Magna. Nick is ridiculously handsome, irresistibly charming … and American - everything Abby has learnt through hard experience to distrust. But one thing Nick isn’t is a man who gives up easily, and he’s not about to be beaten by Abby’s prejudice. Can she resist the overwhelming excitement and passion he brings to her peaceful existence? Cool, chic, city girl Olivia flies out to Australia to bring her best friend’s orphaned son, David, home to London. Cattle rancher Guy, who’s been looking after David, wants to keep the little boy with him at Willagong Creek - no place for a woman like Olivia. The only way she can stay and care for David is a marriage of convenience to Guy. Against the wildness and heat of the outback, Olivia’s feelings grow for her strong, masterful husband - but Guy won’t lay a finger on her … until she asks. Will Olivia dare to seduce her own husband? Gussie cares passionately about the Northumberland countryside and clashes with developer Hunter Scott over his construction plans. When Hunter offers her a job as an environmental consultant on the project, Gussie is thrown. Can she make a difference working on the inside of the development? What will it be like working side by side with Hunter? And can her principles stand up to an even more powerful emotion - her growing feelings for Hunter? 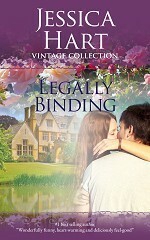 Legally Binding is Jane’s story. Ten years ago she was far too sensible to run away with local rebel Lyall. But now he’s back, and the bad boy is all grown up. Lyall is a successful businessman who holds the keys to the future of her family business and this time he’s going to make sure he specifies the terms … but has he really changed? And will Jane risk her heart again?